Ipswich Symphony Orchestra has performed concerts in Ipswich since 1902 and is one of the oldest amateur orchestras in the UK. During more than a century of high quality music making, the Orchestra has built up an enviable reputation for performing adventurous and challenging programmes. Previous conductors include Sir Colin Davis and Rumon Gamba. Our present conductor, Adam Gatehouse, has worked with the Orchestra since 2000, during which time the repertoire has been expanded and developed to encompass some of the greatest works of the symphonic repertoire - including symphonies by Mahler, Shostakovich, Tchaikovsky and Rachmaninov, as well as music by Beethoven, Strauss, Debussy and Leonard Bernstein. In recent years the Orchestra has worked with some major world-renowned soloists including Martin James Bartlett, Savitri Grier, Sheku Kanneh-Mason, Pavel Kolesnikov, Steven Osborne, Pavel Kolesnikov, Imogen Cooper, Jennifer Pike, Laura van der Heijden, Nicola Benedetti, Dame Felicity Lott, Julian Lloyd Webber and the Orchestra’s Patron, Noriko Ogawa, bringing some of the very best international talent to Ipswich audiences every season. Working within our community is important to the Ipswich Symphony Orchestra. Our Summer concert has been a significant component of Ipswich Summer Events for many years. In March each year we present an afternoon Family Concert which, by careful choice of popular music, aims to engage and inspire a new, young audience to take part in live musical performance. All our concerts are performed in the Ipswich Corn Exchange. Tickets are available from the Ipswich Arts and Entertainments Booking Office and orchestra members. Further information is available on the Tickets page. 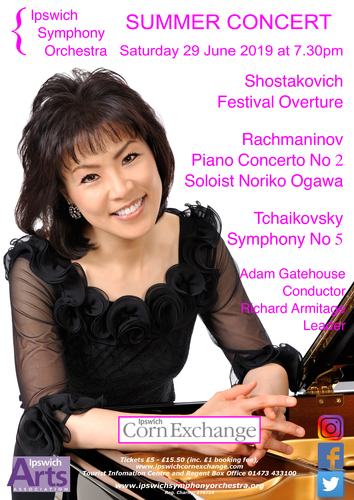 Please explore our website to see what we do, like us on Facebook (Ipswich Symphony Orchestra), follow us on Twitter (@iosoctweet), and share photos with us on Instagram @ipswichsymphony). We hope to see you at our concerts very soon. The Ipswich Symphony Orchestra is a Member of the Ipswich Arts Association and the Making Music organisation.